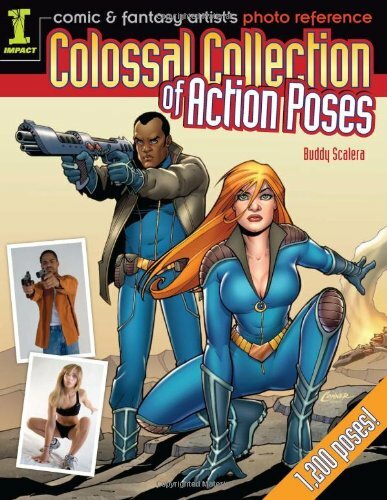 Colossal Collection of Action Poses is the latest book from Buddy Scalera. It's a photo reference book of human poses. I think it's extremely good value because this 3-in-1 book is only a few dollars more than the price of one separate book. This book doesn't come with a CD-ROM though. Created specifically for comic book and fantasy artists, the Colossal Collection of Action Poses features page after page of energetic, high quality, artfully composed reference photos. This isn?t your average visual aid full of boring, lifeless models in the same staid poses. In this book, you get WHAM! (Karate chop to the head!) WHOOSH! (Leaping out of danger!) ARGH! (I?ve been shot!). Running, flying, kicking, wielding weapons, it?s all here, along with a great selection of casual activities (talking on the phone, getting dressed, drinking) for carrying your storyline forward. This looks like a good book, and, there are many books like this one for sale. Why doesn't someone publish a book on "hands". We need a good book and male and female hands in different position. That is a must have for any artist's library. Wow, they need to re-check the poses before choosing it as a cover. Hands/Perspective of the Black dude holding the shoulder is suspect. Having said that, I've seen some Buddy Scalera's books and can help a lot even for the seasoned artist. Nice spot there. A little Escher magic, I say.